This competition was organized to create awareness among younger generation in villages to enhance their knowledge about the urgent need of maintaining healthy life for their future betterment, Rotaract Club officials said. Art works of more than two hundred students from about thirty schools in the two education divisions were displayed at the exhibition. Students from Year 1 to Year 11 participated in the art competition in two divisions. Schools excelled in the competition were awarded prizes in kind such as toilet facilities, school garden and urinals. Certificates were distributed to each student participated in the competition. In addition all students were given a mango sapling to plant in their home garden, sources said. IFSP-GTZ Trincomalee team leader Dr.Dedo Geinitz, IFSP Nutrition and Health Advisor in Trincomalee Ms Gabriele Goetz and Trincomalee Rotary Club President Mr.R.Rajarammohan, Trincomalee Rotaract Club President Mr.R.Ramchander, past president Mr.K.Joseph and several others participated in the event. 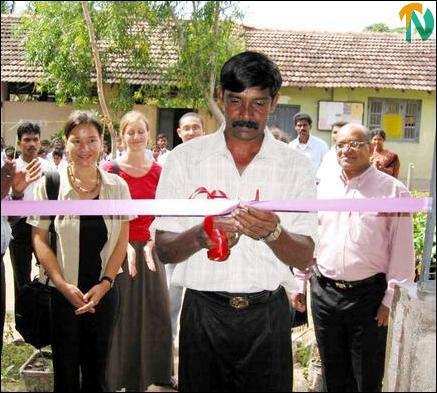 At the commencement Killiveddy Maha Vidiyalayam Principal Mr. P.Thevarajah declared open the exhibition.